The wheat stitch or the wheatear stitch is a variation of the chain stitch. 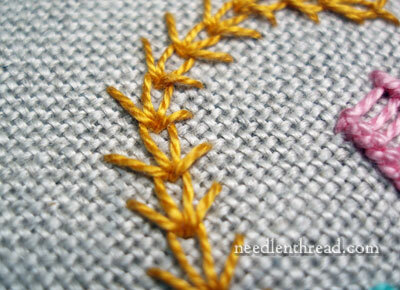 It combines the chain stitch with little diagonal barbs, resulting in a line that resembles an ear or stalk of wheat. You can use the stitch to embroider a stalk of wheat, by adding a little straight stitch to the top of your line, as I did in the video below. Or you can simply use the stitch as a decorative line stitch. Any type of thread works for this stitch. If you want a very fine embroidered line, or a delicate ear of wheat, use one or two strands of regular floss. The line above (in blue) was worked with floche, and in the first photo, the bold and heavy line of wheatear stitch is worked in perle cotton. If you’re looking for other hand embroidery stitch instructions, feel free to visit my collection of hand embroidery stitch videos! i am a beginner. your video tutorial is excellent. i would like to know what kind of thread you are using in your tutorial.In my place i only get embriodery yarn which is thin. You can use any thread for the stitch. In the video, I’m using floche, but really, any type of thread works well with this stitch. 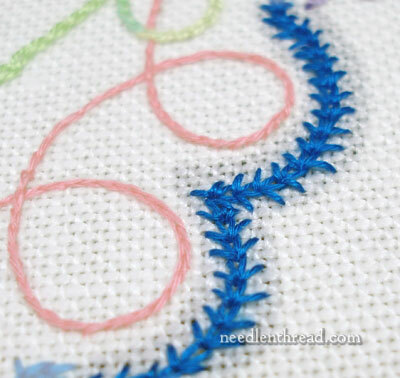 Keep in mind, the end result of the stitch will be thicker, with a heavier thread…. What pattern is that one above the video. I would like to do something like that. If you know where I can get it please let me know. I went to the second hand store today and found some a bag of floche and gold silk. I have no idea how old it is, but it is looks okay. Good find! Hi, Nora – That’s an ecclesiastical design I drew about 8 years ago, and I didn’t keep it. I’d like to re-draw it one of these days, but drawings never seem to work out the same way twice for me! Your find at the second hand store is great! I love it when that happens! I am so happy to be able to learn from your videos, I never embroidered, so your site has been a saving grace. I had always wanted to take classes but living in a rural area there isn’t anthing available. I have to see visually to understand the stitches, and yours are just what I needed. Thanks so much for the video tutorials. Thank you so much for these wonderful videos! I am very new to embroidery and I have tried time and again to learn these stitches from embroidery books, and I could never quite understand how to embroider what I needed properly. Your videos are incredibly helpful! Mary, this stitch is not included in the list under letter W.
thank u so much. i admire your work that u have done in hand embroidery. I also do embroidered dress and saris and indian chaniya-choli.so your site is very helpful for me. I order the magazine now Inspirations and can’t wait to order some of the kits. One thing I would like to know is how to put a picture on the back of my shirt jacket so I can embroider it with threads and beads, Any tips or recommendations would be greatly appreciated. Mary, your stitch tutorials are absolutely the best I have found. Thel clarity of directions, pace and your voice are perfect. Thank you for sharing your knowledge and expertise. Muy buenos tus vídeos! Estoy encantada con tu trabajo, y te agradezco mucho que nos enseñes. De paso haces una gran labor para que esta tradición de bordado no se pierda.